The Hilton Wilmington Riverside is located on the East bank of the Cape Fear River, directly in the midst of historic downtown. Two 9-story towers offer a view of the river and the historic downtown area. Rooms offer up-to-the-minute amenities including dual-line telephones with voicemail and high speed internet, four cup coffee makers and full sized iron and ironing boards. The hotel offers a 24 hour fitness and business center. The hotel offers dining in Spencer's which features American cuisine and daily chef's specials. The River Club Lounge features panoramic views of the Cape Fear River and is the perfect spot for an evening cocktail. Guests are invited to relax with a swim in the outdoor pool, or to workout in the hotel's fitness center. The best golf and tennis facilities on the East Coast are located nearby. 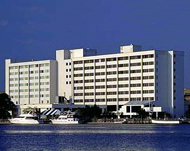 Hilton Hotel Wilmington The Hilton Wilmington Riverside offers deluxe guest rooms with either one king or two double beds. Our rooms feature either a Historic View of Downtown Wilmington or a view of the Cape Fear River. All rooms feature complimentary coffee daily with four cup coffee makers, full size iron and ironing boards, hair dryer, daily newspaper and electronic key lock entry.